Distribution and habitat: Peperomia caperata is an epiphytic in the jungles of South America which is their natural habitat. Description: Peperomia caperata has heart-shaped, dark green leaves up to 4cm (1.5 inch) long with corrugated surface; the green of leaves tend to look almost black in the base of the corrugations. The leaf-stalk of Peperomia caperata are red or pink; white flower spikes of varying lengths may be produced throughout summer and autumn. The flowers are not particularly colourful in their own way, but quite charming, reminding one of attenuated Anthuriums or Arum Lilies. They do in fact consisting of a myriad small flowers arranged along arching stems that are sometimes tinted red or brown. The plant does not normally grow above 25cm (10 inch) high. Houseplant care: Peperomia caperata should be occasional pruned during the spring and summer to keep the plant bushy. Light: Peperomia caperata is growing well in good light conditions. A slightly shaded position away from direct sun is ideal during the summer months, but in winter give it much light as possible. Peperomia caperata thrive under fluorescent light and makes ideal specimen for bottle gardens and terrariums. Temperature: Peperomia caperata need an average temperatures, with a winter minimum of 10°C (50°F). Provide a humid atmosphere from spring to fall. Plunge the pot in moistened peat or place the pot on damp pebbles and mist the plant twice a day, once in the morning and once in the evening. In winter ensure that there is some ventilation, but avoid droughts. Water: Water sparingly at all times. Allow the compost to dry out between waterings and keep it almost dry throughout the winter. Water form beneath or carefully from above – the stem rot very easily – and use tepid water. Fertiliser: Peperomia caperata needs occasional liquid fertiliser at half-strength from late spring to early autumn. Potting and repotting: Peperomia caperata should be repotted annually in spring but the maximum pot size necessary is 9cm (3.5 inch). Peperomia caperata has very small root and can be potted in half-pots, shallow pans, bowls or hanging baskets. Use a peat-based potting mixture. All pots should have a layer of drainage material in the bottom to promote drainage and prevent plants from being exposed to over-watering. Propagation: Peperomia caperata can be divided at potting time in spring. They are removed and separated into smaller pieces, each with a few roots attached. Leaf or stem cuttings can also be taken in the spring or summer. The lower leaves of the shoots are removed and a cut is made below the bottom node (joint). They are then laid on a bench for an hour or two to allow a protective corky skin to form over the cuts. They are then inserted in a propagating case with bottom heat of 21-24°C (70-75°F). It is best not to seal the top completely, as the plants are semi-succulent in nature and excessive humidity is detrimental. When enough roots have formed, cuttings can be planted in 8cm (3 inch) pots or in hanging baskets. Tip cuttings are likely to root in four to six weeks. Leaf cuttings may take a little longer. Overwatering will result in wilting or discoloured leaves and/or stem and leaf rot. Grey mold (botrytis) will appear at the base of stem if the air is too stagnant. Brown-tipped leaves may be caused by sudden drops in temperature. Treatment: Remove the affected leaves immediately and always keep the plant away from droughts and cold window-sills. 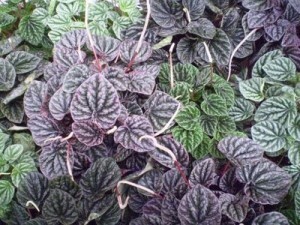 Uses: Peperomia caperata can be used in terrariums, mixed planters or in shelves by warm, sunny window. Peperomia caperata makes a perfect foil for larger variegated Peperomias. In frost-free gardens, Peperomia caperata can be used as ground-covers. Peperomia caperata ‘Emerald Ripple’ is a shorter plant with smaller waxy leaves in a denser cluster. Peperomia caperata ‘Little Fantesy’ is a dwarf form. Peperomia caperata ‘Variegata‘ (also known as Peperomia caperata ‘Tricolor’) has smaller leaves.